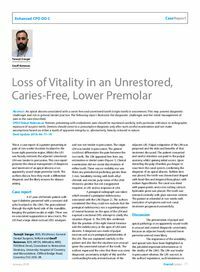 Abstract: An apical abscess associated with a caries free and unrestored tooth (virgin tooth) is uncommon. This may present diagnostic challenges and risk in general dental practice. The following report illustrates the diagnostic challenges and the initial management of pain in the case described. Clinical relevance: Patients presenting with endodontic pain should be examined carefully, with particular reference to radiographic exposure of suspect teeth. Dentists should come to a presumptive diagnosis only after such careful examination and not make assumptions based on either a tooth of apparent integrity or, alternatively, heavily restored in nature. Author notes: Taranjit Sangar, BDS, BSc(Hons), General Dental Surgeon, Telford and Geoff Bateman, BDS, MFDS, MMedEd, MRD, FDS(Rest Dent), Consultant in Restorative Dentistry, University Hospital of Coventry and Warwickshire, Clifford Bridge Road, Coventry CV2 2DX, UK. Objective: To highlight the uncertainty that can be faced when diagnosing endodontic lesions associated with apparently sound teeth whose neighbours are heavily restored.